Students in the MA in Design Studies at Parsons The New School for Design. The MTA and Rikers Island have a complicated relationship. Over the years the massive jailing complex has fallen on and off the subway map. An erratic absence, today Rikers Island is labeled on station maps but not inside trains, on digital versions but not in digital kiosks. Whether an accidental oversight or an intentional omission, the island’s obscure status is telling. 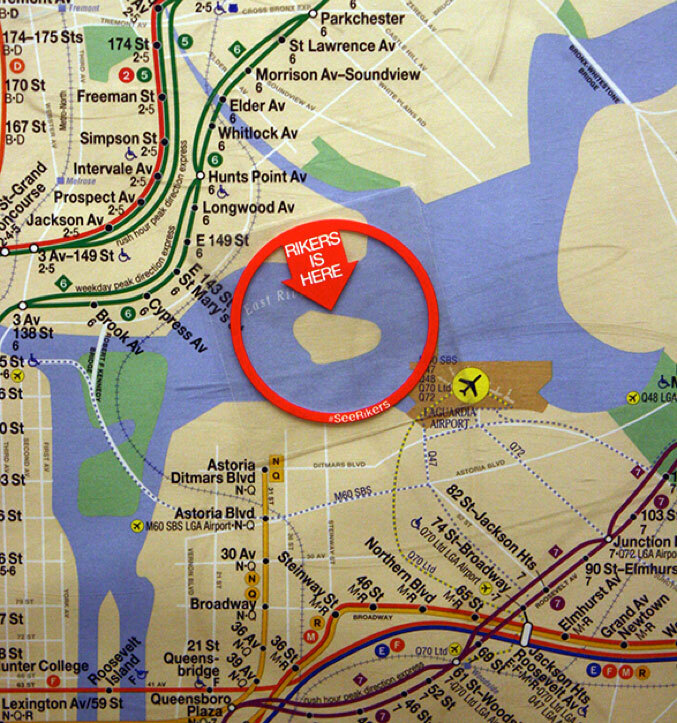 Rikers’ “disappearance” from the subway map is in many ways emblematic of a broader cultural willingness to overlook the places, policies, and practices that support the systemic violence of mass incarceration. Situated between LaGuardia Airport and the Bronx, Rikers Island is at the center of New York City. Its ten jails hold over 10,000 people each day and employ nearly the same amount of correctional officers, and yet it is one of the few islands that remains unnamed on the subway map. To address this blank space, we thought to appropriate the Transit Authority’s own place-making iconography. The common and familiar “You Are Here” decal, which locates travelers in cartographic and geographic space, is altered to “Rikers is Here,” decentering the passenger while pointing to the jail. Whereas the MTA’s label serves as an individual wayfinding tool, ours signals a collective void. The sticker invites a simple gesture, and yet to put it on the map is to make an explicit political action. With the adhesive artifact in hand, the passenger must publicly acknowledge and address the erasure. What was once invisible is now glaring, encircled by a bright red arrow that calls on the viewer to #SeeRikers. Affixed to the MTA map, the sticker aims to expose an institutional presence and implicate commuters in the carceral state. To #SeeRikers is an attempt to identify a physical place as well as to activate a space of appearance where critical debates and conversations can unfold. The power and the flaw of the decal lies in its ability to make tangible but ephemeral statements, and while it is a tiny imposition on the world, we hope it can provide an entry point into the urgent movement to reform our criminal justice system.